I’m just getting back to my desire for cooking elaborate things. My biggest supporter and motivation being gone… for awhile I was having to remind myself that it was time for food, again, and eating it was a chore. Monday was ideal, since our friends are still coming over every week and they’re on board anytime I’m feeling creative! I had last Monday off from work and resolved to make something extra yummy, having been sick the previous two weeks and resorted to ordering pizza. He’d always wanted to make beef wellington, having been inspired by Gordon Ramsey, but never managing to get there. After a bit of research, I was ready to go and decided to make individual ones, using filet mignons. Providence smiled on me, for the day after I had thus decided, my boss sent me to Wegmans, the largest local grocery and I was able to get prosciutto de parma! Monday rolled around and I couldn’t wait to get into the kitchen! Somehow I managed to wait until 17:00, then into the kitchen I went! Started with the mushroom duxelles (I wish I spoke French and knew how to say this word! ), using the mini food processor to finely chop all the mushrooms (work smarter, not harder!). It took them quite awhile to brown up, but they smelled wonderful! While the duxelles cooled, I seasoned and browned the meat. I used pre-bought puff pastry sheets (my one concession), rolled thinly and cut in half. Having prepped everything, I took piece of puff pastry, laid a piece of prosciutto in the middle of it and placed a filet on top of that. I then spread some of the duxelles on the meat, folded the prosciutto over that and folded the pastry dough around the entire thing, sealing the seams with egg wash. Lastly, I placed it on a parchment-lined baking sheet and egg washed it all over. Into the oven for 20 minutes, then out to rest before we cut into them. The suspense was getting to everyone, for they smelled amazing! I had served a brie en croute with black raspberry as an appetizer and it had worked, they were hungry!! Success! I’m not one to toot my own horn (that was his job), but they were cooked perfectly and were a beautiful red in the middle. I enjoyed watching everyone taste theirs before sampling mine. WOW! It was full of complex flavors, one of those I-can’t-believe-I made-that moments. One week later, I’m still stuck there. The broccoli casserole I’d made to go alongside it was tasty too and has potential for many variations, I also shall hold onto that recipe. As I’m hoping you noticed, I haven’t been on lately. Allow me to explain… *exhales*… my fiance had a heart attack one Sunday morning and has gone up to Heaven. Needless to say, this knocked a lot of the wind out of my sail, not to mention the fact that I was kept busy with arrangements. I did do some cooking,baking, and eating over the summer, but since work goes crazy every summer, I was too exhausted every evening to do more than survive. Not to mention that I’ve been debating how to post this news. Since school has started again and I have more free time, I have forced myself to post this. I am not entirely sure what the future holds for me, but I hope to keep this blog going for a little longer at least. Spoiler Alert: Another disappointment in Carlisle. If there was just one restaurant with consistently tasty food around here, they would thrive! We’d seen this new spot once before, but they weren’t open, so when we passed them again last Saturday, and they were serving, we went in to see a menu. It had several intriguing dishes and so we got a table. The water was from the tap, but served in a glass bottle to give the appearance of being something better. We’ve seen this before in Carlisle. The water was unpleasant and the soda we ordered instead was nearly flat! After much discussion, we settled on two dishes to share; a duck salad (duck leg confit on arugula) and butternut squash ravioli with rabbit confit. One of the dishes came with a side, so we both had a small salad. They were kind enough to divide all the dishes onto separate plates before serving. When asked for our choice of dressing, we inquired if the vinaigrette was made in house… we never got an answer, just that dressing on the side. We asked for some bread to go with the salad, but the salads were long gone before the rolls arrived, still frozen on the bottom. This wasn’t encouraging. After more then half an hour, we were told the delay was do to the ravioli we’d ordered, and were thus confused when our plates arrived to determine that they were of the pre-bought, frozen variety. Why did they take so long?! Everything else had sat under the heat lamp for so long that our meat was dry and over-done. The sauce on the ravioli showed promise, but not enough to redeem the meal. All in all, we still managed to have a good time, but for the money spent we could have had a fantastic time at one of our favorite restaurants in Harrisburg. We do, however continue to hold out hope that one day, there will be a great place to eat in Carlisle. Settled in to eat and found myself suddenly very tired. Having gotten everything on the table after pushing all day, I was out of steam, but still managed to fill my plate, mouth and stomach, in that order. Shrimp puffs; Two of my friends requested the recipe and one doesn’t cook at all! 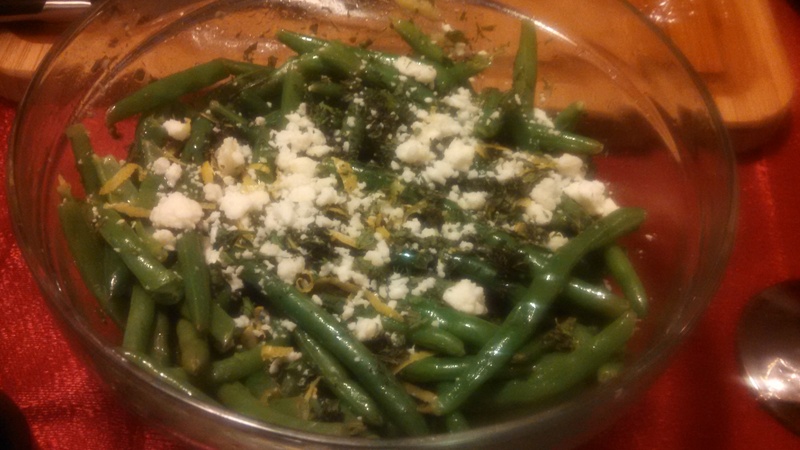 Herbed Green Beans; The letdown of the night to me, the feta cheese I’d gotten was store-brand and VERY mild. Also, the lemon peel just didn’t work for me. Cranberry Sauce; Might have been made a little too far ahead, the orange had heightened and the sugar lessened, but then, I like tart things, so I was fine with it. Giblet Gravy; There was so much flavor that every gravy after this shall have a hard time meeting the mark. 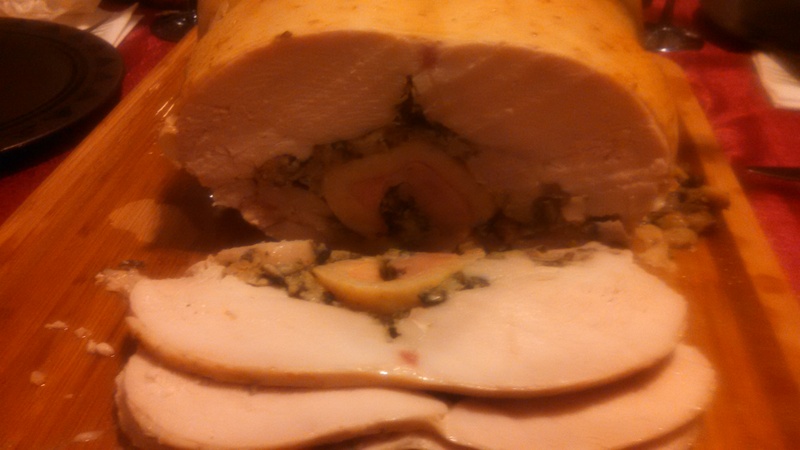 Turducken; Done to perfection, the chicken was done, but the turkey beasts weren’t dried out at all! I love meat thermometers. Wild Mushroom, Bacon, and Sourdough Stuffing; all three elements held up well against each other. Baked Alaska; I couldn’t fit it in my freezer once it was fully assembled and had to resort to putting it outside, where it was below freezing, but not cold enough to keep the ice cream as firm as it needed to be. Still, all the elements turned out better then I could have hoped (the meringue was a first and the cake was a new recipe). 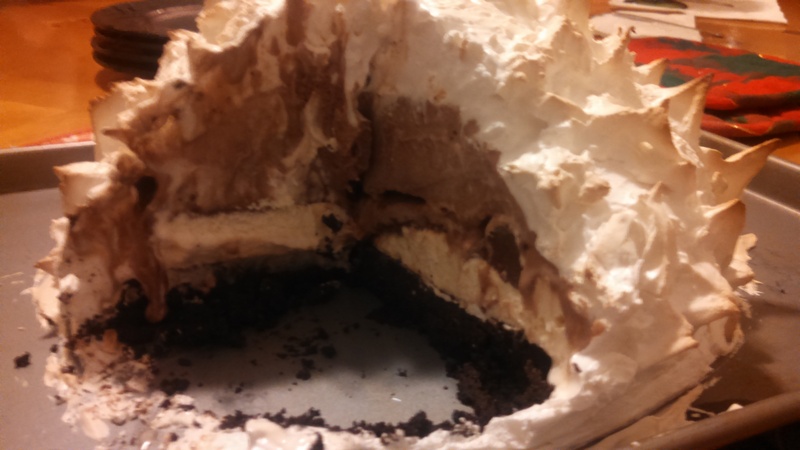 We’re going to be putting meringue on everything, it was amazing. Tasted like a cloud, then a toasted marshmallow when browned! All in all, a successful feast! 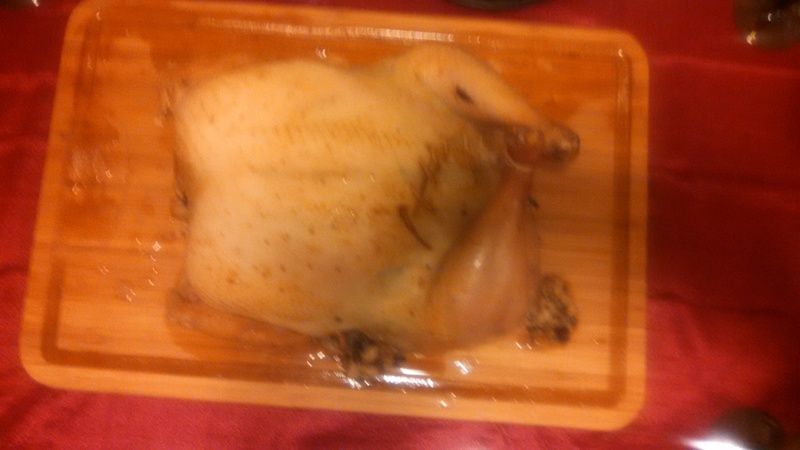 I’d plotted out my schedule and began thawing the turkey on Christmas, eventually adding the duck and chicken. I had a very full refrigerator… so full that my chicken was still icy and hard after 24 hours! Monday saw me out shopping, then home again to assemble the ice cream portion of the baked Alaska and bake the flourless, dark chocolate cake. Made the cranberry sauce as well. 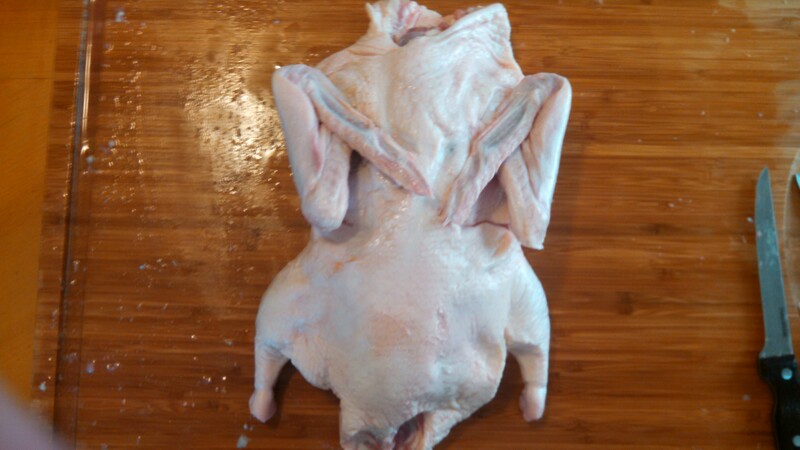 Tuesday morning saw me boning all three birds, which took quite a little while, but I did it! 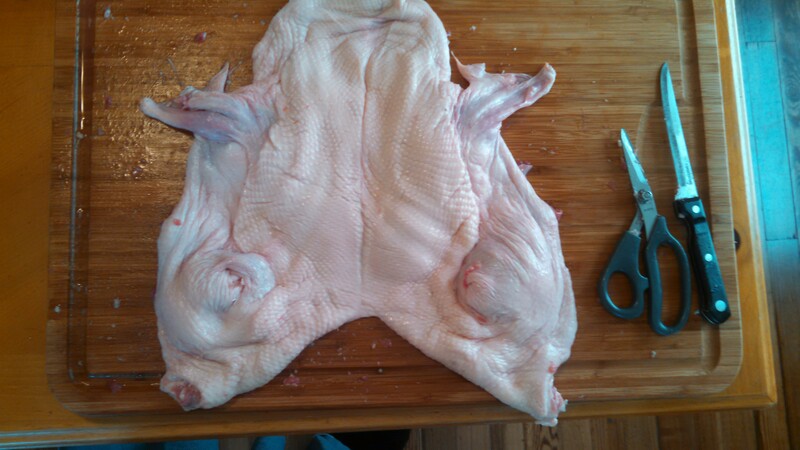 A bird completely without bones becomes a rather shapeless and somehow amusing, lump of meat, fat and skin. I then put them into a large pot with several gallons of brine (1 Cup brown sugar and 1 Cup kosher salt per gallon) in it and weighted the whole thing down with a plate. This then went on the front porch, where it was quite cold, I’d run out of room in the refrigerator. I pre-roasted the mushrooms and toasted the sourdough bread, both for the stuffing and called it a day. Wednesday (day of the feast), I woke up excited and ready to get into the kitchen…but it was far too early. So instead, I ate breakfast and read a little, until it was finally 10:00. 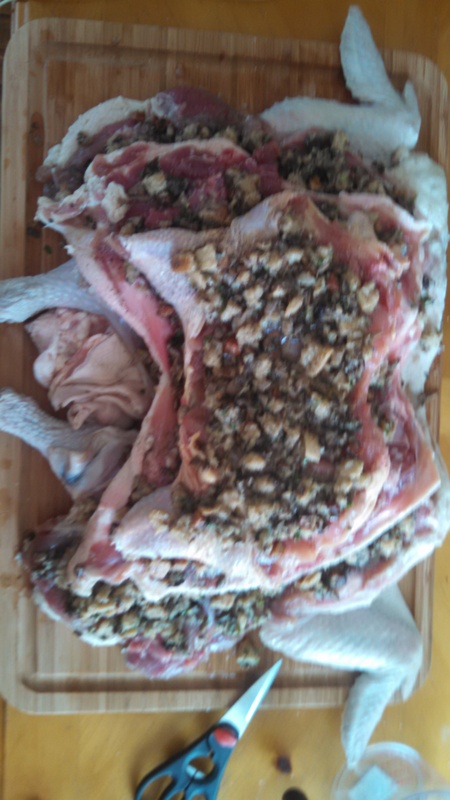 First order of business was to finish the stuffing, which went rather smoothly and smelled fantastic. My sous chef (a.k.a. dishwasher and lifter) for the day arrived a little before 11:00 and we set about assembling the turducken. The trickiest part of this proved to be the trussing and it would have been impossible without my helper! I’d found that the skin had been torn on the turkey when I’d removed it from it’s wrapping yesterday, so this necessitated rolling it over and trussing up that side as well. Another, smaller complication was getting the thermometer into the chicken, I’d stuck it in before we’d folded everything back together, only to realize that it needed to come out closer to the neck, which I managed by sticking my fingers though the trusses and feeling around for the chicken breast. I’d become very familiar with these birds by this point! We rubbed it down with a bit of paprika and stuck it into the oven. On to other things, the next order of business was to get the Baked Alaska completely prepped. I first cut the cake down to size (finding that the leftover crumbs were incredibly rich and would hold up well against all that ice cream!) and stuck it onto the ice cream. I then set about making the Italian meringue. 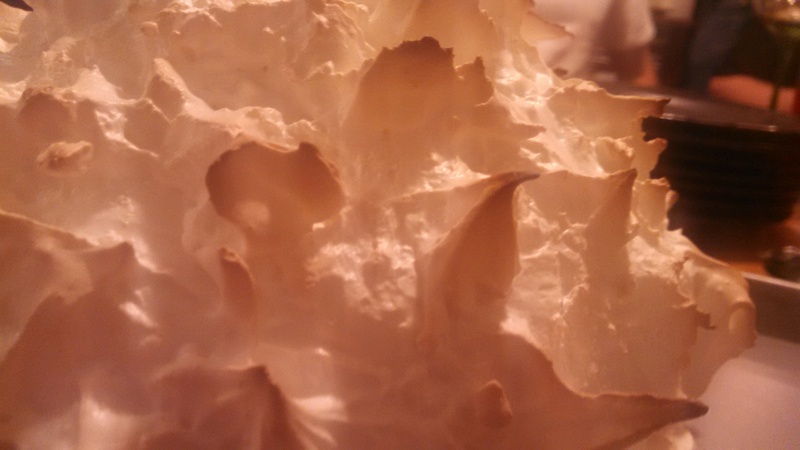 I must confess that besides the birds, I was most nervous about this… I’d never made any sort of meringue before and have to admit that I’d had no desire to, they didn’t sound tasty to me. I pictured them tasting like whipped cream, which I skip whenever I can… and everything else I was familiar with/knowledgeable enough about to be able to adjust and save, but this felt sink or swim and I didn’t have time to sink! I worried for nothing though, it all worked perfectly and I soon had a mixing bowl full of clouds. I thoroughly enjoyed watching the beaters transform the mixture into exactly what I’d seen on tv. Thoroughly coated the turned out ice cream with this, then covered it and set it outside, it wouldn’t fit in the freezer anymore. At this point, we took a bit of a break, my sous chef had kept up with the dishes and my fiance had arrived (no, they were not the same person today), so we paused to partake of the extras/samples. We’d had extra stuffing and meringue that we’d finished in the toaster oven and some duck skin that we’d trimmed from the turducken and crisped up to snack on. We began to get excited as everything met or exceeded our expectations! We set the table and prepped the rest of the side dishes. mixing up the shrimp puff’s filling, peeling and soaking the mashed potatoes, and assembling the dressing for the green beans… then we hit a wall. The feast was to be at 16:30 and everyone began to arrive, but the thermometer was nowhere near where it needed to be! Fortunately, they were all going to be here until midnight, so there was no rush (except for our hungry bellies!) and I managed to resist the urge to turn it up. We finally hit the correct temperature at 18:30 and pulled the birds out, putting them on my new (purchased just for this occasion) carving board to rest. At this point, I must apologize for the drop in photo quality, but things got a little hectic…. Sous chef handled the mashed potatoes, fiance finished off the gravy, I popped the shrimp puffs in the oven and steamed the green beans while putting the cranberry sauce on the table, and voila! One Christmas feast! We have a group of friends, guys mostly, that have come over once a week for several years to play games, watch a movie, or whatever we end up doing. They chip in towards whatever dinner I make and have served as my taste testers on occasion. The past several years, we’ve been having Christmas parties, last year’s found us playing live Clue all over my apartment. 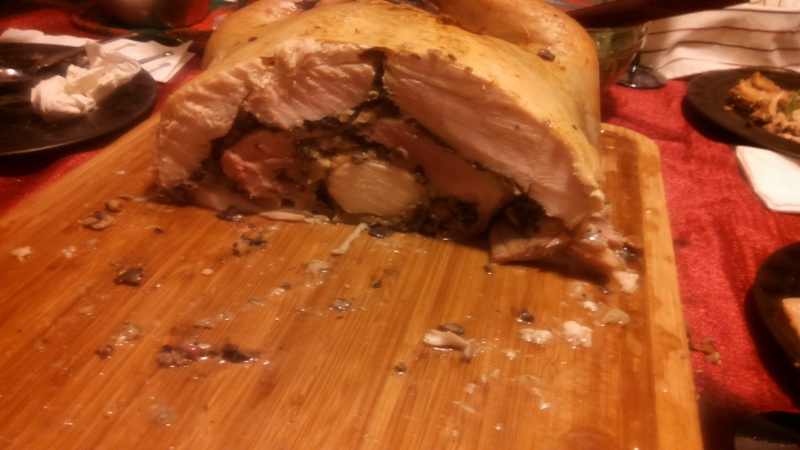 This year, I proposed several ideas, including making a turkducken and having a feast, guess which one they went for? Yes, the turducken. The party got moved from our normal evening to the only other everyone had free, New Year’s Eve, hence the confused title of this post. Shrimp puffs; These were rather simple and included my one cheat, a roll of store bought biscuits. Herbed Green Beans; You have to have a vegetable. 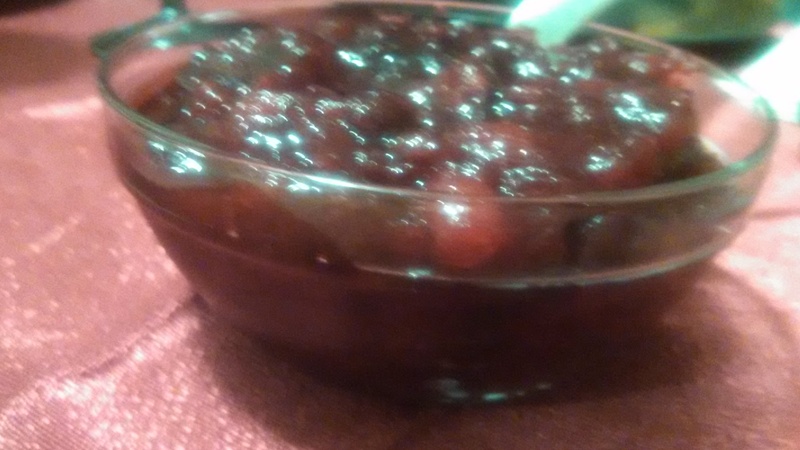 Cranberry Sauce; Believe it or not, I’d never made this before and was thrilled with how well it turned out. I put in a little lemon zest and liked the brightness it added. Found a recipe for “cosmopolitan cranberry sauce”, but that wouldn’t have been legal for all my guests, so all I could do was add it to my recipe box. Giblet Gravy; This had giblets from all three birds, as well as wing tips and spines (but no livers) and was awesome! There was so much flavor that every gravy after this shall have a hard time meeting the mark. We filled a pitcher with it all and had enough leftovers that the next time we got together we were eating waffles and gravy for dinner. 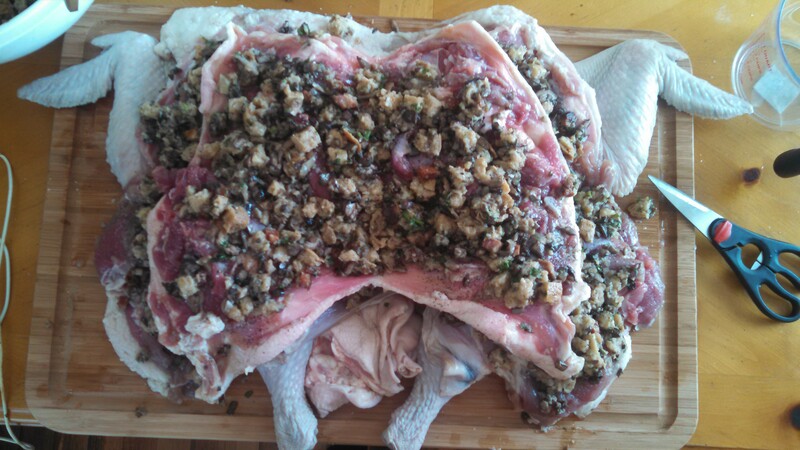 Turducken; Of course. 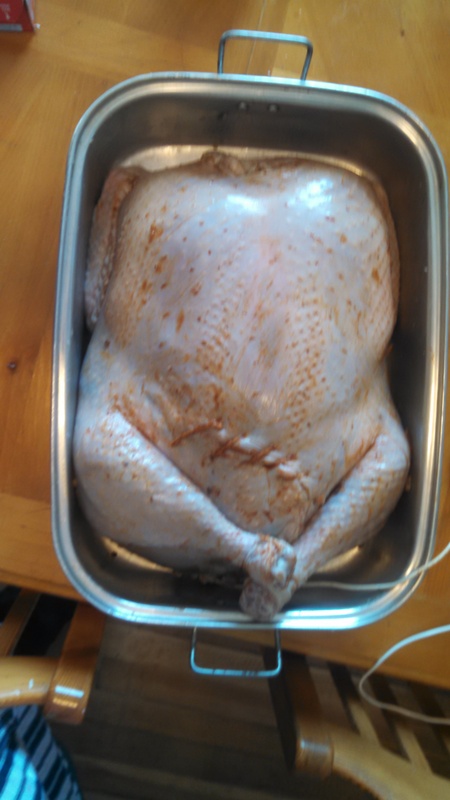 I followed Paula Deen’s brine and roasting instructions, substituting my own preference of stuffing. Wild Mushroom, Bacon, and Sourdough Stuffing; ala Bobby Flay. Wild mushrooms and bacon need no explanation. 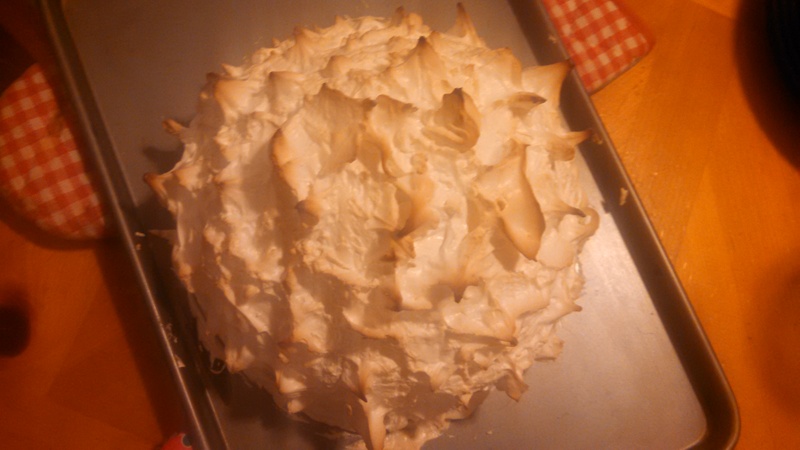 Baked Alaska; with Italian Meringue. Seemed fitting for a winter holiday feast. After reading the book last fall, it was finally my turn to borrow this movie from the library and I picked it up last night. My fiance wanted to watch it right away but I was apprehensive… I hadn’t enjoyed the book. It seemed too determined to stay “real”, making sure it wasn’t a book one read to escape (or even one felt happy reading). Also, call me a prude, but I have a hard time liking main (or for that matter, any) characters that debase themselves through immorality, even if they were traumatized as a child. There wasn’t as much cooking and food dialogue as I expected either and I found myself drooling the most over Madame Mallory’s cookbook collection! That being said, once I got over the fact that it wasn’t exactly the novel (something I’m a stickler for, just ask anyone who’s ever watched a movie based on a novel with me), I found myself liking the movie more. The food made me hungry, both what I saw on plates and what they talked about throughout the story. I could relate more to the main characters and it wasn’t as somber as it went along. My fiance, who loves a good romance, was thrilled when Hasan got the girl in the end. Sure, it wasn’t the greatest movie either, but if you love food like I do, I find myself (and I’m shocked by this) recommending you save some time and skip the book, go straight to the movie. Just make sure you eat first! I’ve been thinking I’d make a King cake this weekend, but I’ve never had one and now as I look at recipes, I find three variations! I don’t mind the work, but I’m not sure which version is “authentic”. Does anyone out there know? 15 batches of Christmas cookies! When I was a girl, we had Christmas cookie day at my house. We’d get up in the morning and fill the kitchen table with every ingredient we’d need to make all the cookies we wanted, as well as the necessary bowls, measuring devices and recipes. Mom would then assign recipes, the type and number dependent on age and skill, and bowls, based on the size and number of batches we were to mix. Some of us would have two or three bowls in front of us. We’d then begin the mixing, Mom had divided the recipes up into stages that had us all adding the same things (if out recipe called for them, of course) at the the same time, i.e. we’d pass around butter and shortening, everyone getting what they needed, then we’d pass around the sugar, e.t.c. We kept going in this manner until they were all completely mixed. We’d cover them and label them with type, temperature, and baking time. Batches that need chilled would be placed in the fridge or on the front porch and we’d turn our attention to the others. There were several stations, dropping/rolling and cutting, decorating (if the cookie called for it), baking (you were to rotate trays/shelves and make sure they were done perfectly), and cooling and removing from trays. 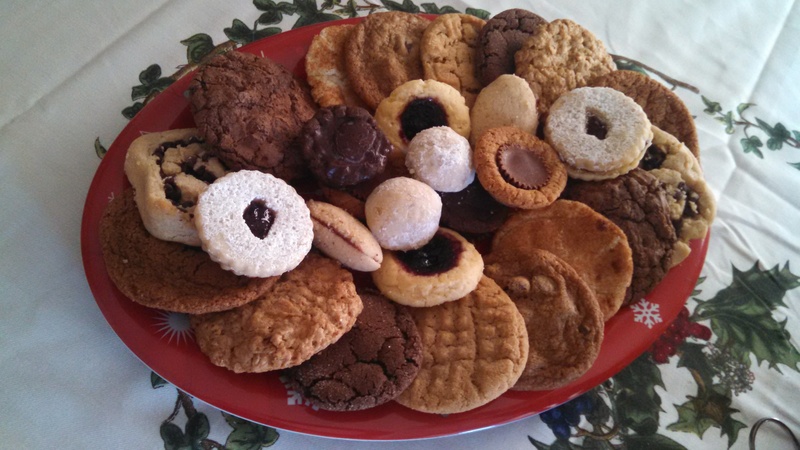 When I was little, I remember Dad being on oven duty most of the day, but as my two younger sisters and I aged, we would rotate through with Mom, at least per batch, more frequently if it was a “fun” batch, say rolled sugar cookies. We’d have most of them baked by the end of the day, and filled most of Mom’s larger food storage containers with cookies. Most common were chocolate chip, party, rolled sugar, dropped sugar, sand tart, pecan crispies, chocolate peanut butter chip, oatmeal, and snickerdoodle. The days that followed would find us sharing them with neighbors and people at church. Since I moved out six years ago, I’ve only made more then one batch once. 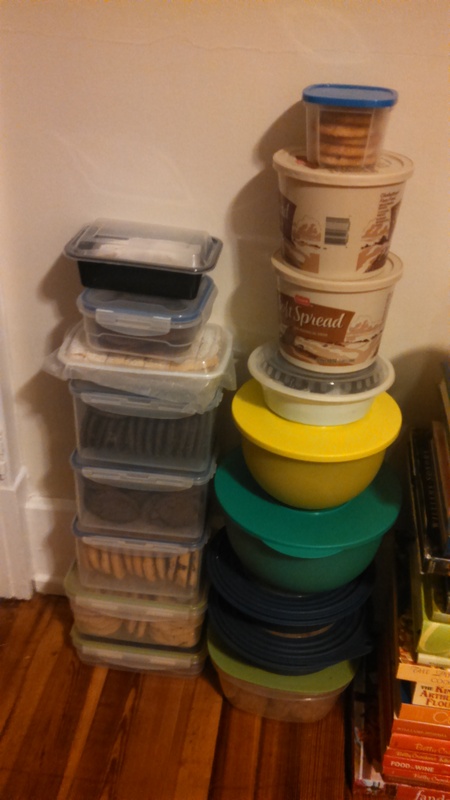 I’m only one person and living with lots of cookies isn’t great for my figure (plus I feel terrible if I end up throwing any away), plus the idea of doing it all solo was slightly overwhelming. Anyways, it was after my last move, as a thank you for the friends who helped (and when you have 3,000 books, you really do owe them!) I did it similarly to the method described above, moving around my table and adding each ingredient to all the appropriate bowls, then stirring. I tried out several new recipes and found a few favorites. It worked out rather well for being just me. 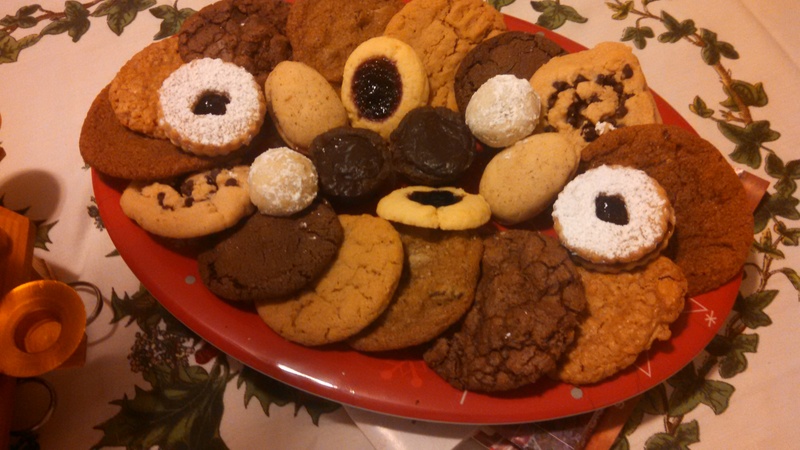 Now, my fiance’s mother has, for as long as anyone can remember, made batches and batches of cookies over several weeks and frozen them until she needs them. Then, assuming they’ve survived the “human mice” who know they’re there, she can assemble trays and have plenty at her disposal. (Oh, I can’t wait to get a freezer!) However, this year, she was experiencing a great deal of back pain, later revealed to be due to several cracked vertebra, and didn’t manage to make any. She’s mending well, but prayers are appreciated, especially as it gets cold and icy up this way. In light of this, he asked if I would make a batch of one of his favorite kinds, peanut butter temptations. I said sure. The day before I went to the store, I asked if there were any other kinds he’d like, already planning to make another of this favorites, auntie Marys. He responded with another seven or so, including some I’d never tried to make. Now this was more then I’d originally thought I’d be baking, but he had a lot going on at work and I wasn’t going to see him for several days, meanwhile I had off work for Thanksgiving, so I thought, why not? Made a master list of all the ingredients, and just how much of each I’d be needing, and set out to the store. Home again, I began mixing, using both my six quart and four quart stand mixers, I bounced back and forth between the two and two mixing bowls with the dry ingredients in them. When I finished a batch, I’d pack it away into the fridge, wash the bowl and beater and start in on another batch. Packing them all up, I found myself out of storage containers, but what a lovely tower I had. Now, I’ve never been a fan of the first two, passing over them every time. They tend to be dry and bland, so I set out to combat that. Made sure that I had good jellys and paid attention to the baking time very closely, pulling them out when they were just done. The linzers took forever, you have to rechill the dough after rolling and cutting them, before baking. Then once they’re out, you have to dust the tops with powdered sugar before putting jelly on the bottom halves and assembling them. Of the four I made that day, these were my least favorite, though they were better then any others I’ve had. The thumbprints were quite good, surprising the fiance, who been dreading having to tell me he didn’t like them. Fortunately, he liked all of them. After two weekends in the kitchen I was tired, but had a lovely time and so many tasty results! New Cooking Equipment for Christmas! I sometimes hesitate to list everything I acquire on special occasions, I don’t want to seem like I’m gloating, but it seems lately that I’ve been getting kitchen things faster then I can find space to store them. A juicer by t-fal, I haven’t used it yet, but the idea is quite exciting! Back before Thanksgiving, I bought a 6 qt. multi-cooker from Cuisinart, which I’ve used once and turned out wonderfully. I love things that can do multiple tasks and do them all well. He, around the same time, got a sous-vide machine, which he’s used several times and it’s always gone well. It’s something we’ve been trying to replicate using cooling racks, clothes pins, and the meat thermometer, so this seems almost too easy! Many, various pans for cake, bread, cookies, mini muffins and so on. I’ve only used some of them so far, but having a surplus of cookie sheets has come in handy and I love the mini muffin tin from my soon-to-be mother-in-law for Christmas that holds 24 at a time! A 6 qt, cooper exterior pan, ask one’s fiance and one might receive! He also brought up an all-clad stainless steel roaster recently. He gave me a large bag of pink salt and an old-timer press/juicer for Christmas, as well as lots of chocolate. Anyway, I love the juicer, it’s so smooth and solid. I’ve gone through many, many oranges in the past few weeks! Also from him for Christmas, a Bread Proofing Box from King Arthur Flour, to help my head ride and turn out well, even when it’s cold (my apartment is averaging around 60° this year, if I had to guess). I’ve used it twice and am afraid I’m not entirely impressed. The lid sits on the box awkwardly and the cord is short! Also, once I divide the dough, I can’t fit both loaves in. Still, it keeps the dough very moist and has a viewing window on the top, which is more then I can say for last year’s method, tucking it only my waterbed…. Someone else sent me some enameled cast iron (various name brands). I’ve orange, red and green now. The problem with this has become the storage, I haven’t cabinet space (it mustn’t be stacked or nested) and the normal kitchen overflow location, the attic, is out. Anyone have an idea? And lastly, we are anxiously expecting the mailman to bring us our Valentine’s Day present (yes, we’ve become the sort of couple who buy cooking things as gifts for each other), a Kitchen-aid Pro Line Hand Blender. We have a small, plastic, corded one, so we didn’t entirely need it, but we’re indulging, hence the romance behind the present.